It’s September and it’s becoming apparent that the hot weather is on it’s way out. Now begins the furious preparation for the cold winter months. 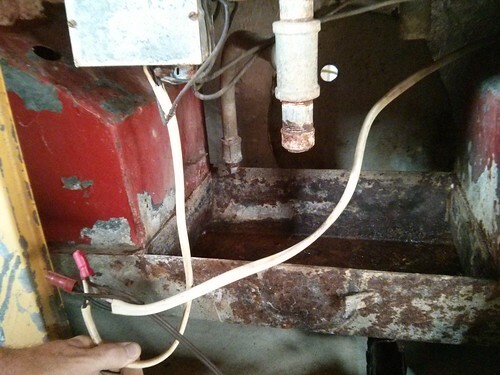 One project that’s high up on our “before winter” list is to get our automatic waterer fixed up. This is the Ritchey fountain that we used last year. It works (at least for the cattle) and it somehow avoided icing up last winter, even though someone replaced the heating elements and thermostat with a single 100 watt lightbulb. Repairing this fountain was possible, but when a used Model 5 combination fountain showed up on Craigslist, the decision was easy. 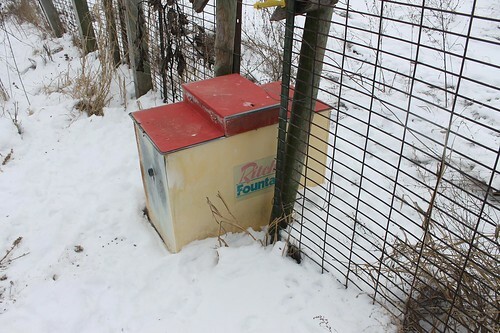 A combination fountain would allow us to water both the pigs and cows all winter long without any worries. I drove down to look at the fountain a few days later. After removing the access panel, I quickly spotted a problem. The fountain had been “decommissioned” as a hog waterer long ago. 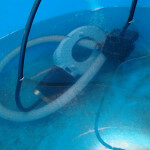 The float, valve and heating element had been removed from the hog water trough. Plus, there was a fair bit of corrosion all around. So after talking the guy down to $160, I loaded up my new waterer and headed back home. 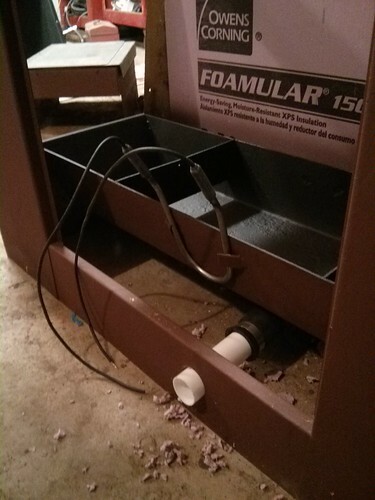 The first order of business was to completely disassemble the waterer. 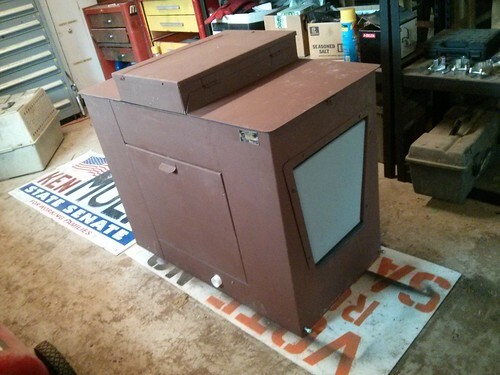 The old 1/2″ fiberglass(?) 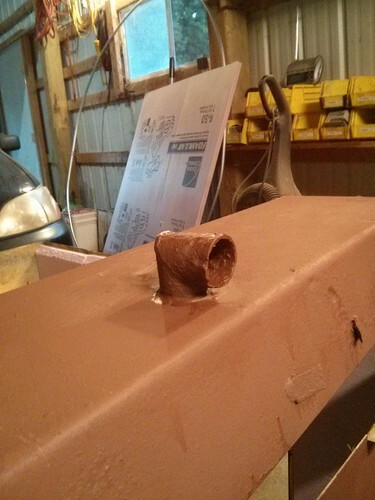 batt insulation had long ago rotted away. 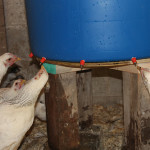 We want the waterer to be as insulated as possible. This keeps the water liquid and our power bills down. 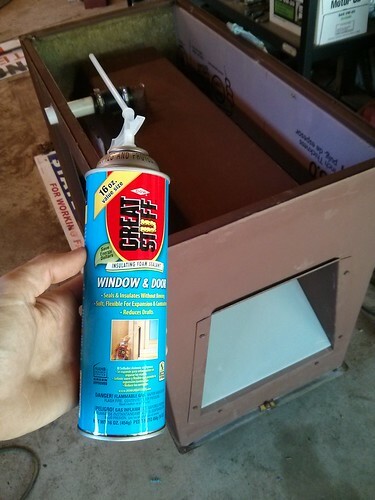 It took just over a half sheet of 1″ pink-board insulation and 2 tubes of liquid-nails to get most of the cabinet covered. 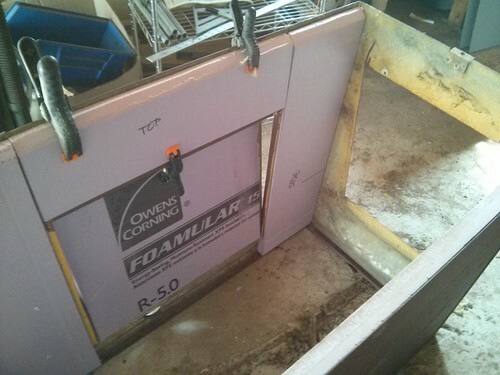 At R 5.0, it’s a good bit better than the R 1.5 that the old fiberglass insulation would have been. 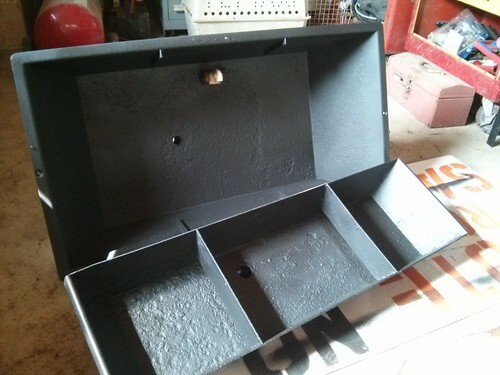 Both the water troughs were painted with Rusty-Metal Primer then top-coated with Leak-Seal. Hopefully that will keep the corrosion under control for the foreseeable future. On the bottom, there was a bit of a problem with the old rusted-out drain pipe. The newer Ritchey fountains use a plastic drain pipe. This old pipe was so corroded that I just cut it off. 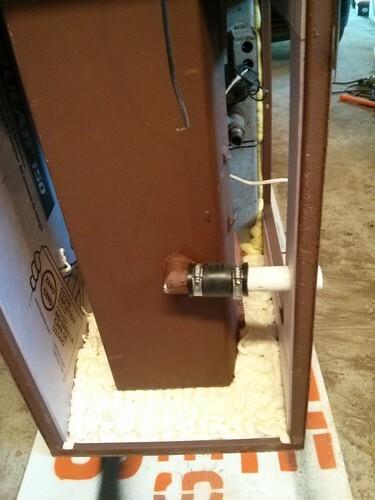 Fortunately, the drain pipe is about the same size as a 1.5″ tailpiece for a sink. 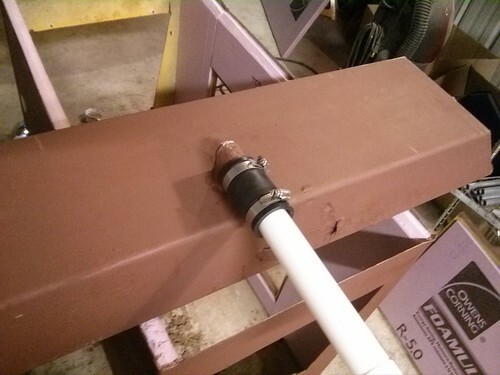 With a 1.25″ rubber pipe clamp, it all went together pretty nicely. 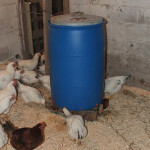 A new heating element, valve and float were procured, putting the hog waterer portion of the fountain back in business. And, of course, no project is complete here at Green Machine Farm without the judicious use of expanding foam insulation. Every nook and cranny was filled with foam, creating a nice easy-to-heat space inside. It’s all back together and ready to be installed. Not bad for about $250. 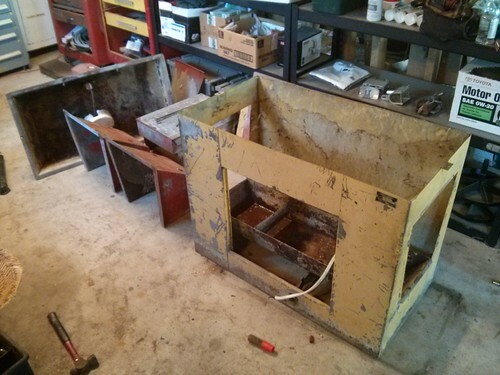 It was a bit of work, but it saved us from having to pony up $1300 for a brand new one.